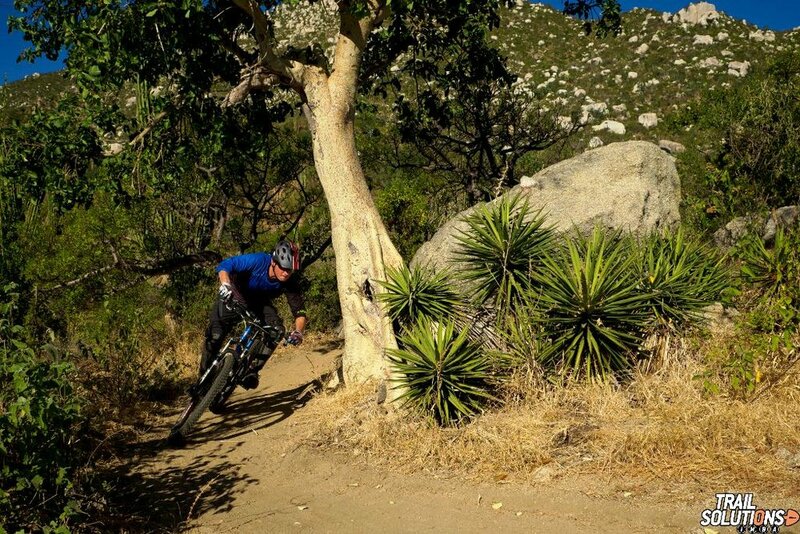 This mountain biking trail — the pride of Rancho Cacachilas — was designed by IMBA (International Mountain Biking Association) and built by our carefully trained crew. 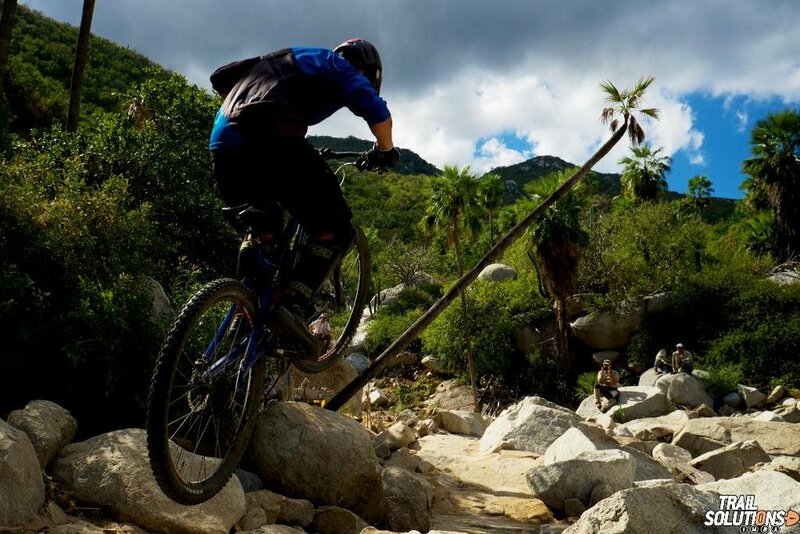 The result is an impressive 9.1-kilometer (5.7-mile), single track trail that winds its way through the mountains, passing large boulders and oases with palm trees. Feel the adrenaline as you descend serpent switchbacks and reward yourself with spectacular views of the mountains and sea. This is for riders with solid technical skills to navigate the challenging terrain. Of course, it also makes for a beautiful hike. The trailhead is located on the main Canoas-Pisos road just north of the area called Campamento. The trail can be biked or hiked as a loop, starting at the trailhead, completing the path at Canoas, and then continuing on the road back to the starting point. Like our trails, our roads are comprised of dirt and rock and are designed and maintained to minimize environmental impact. The additional part along the road adds approximately 2.5 kilometers (1.6 miles) to the total distance covered. Usually, we arrange to drop off bikers at the trailhead and pick them up at the end of the 9.2 kilometer (5.7-mile) trail at Canoas. The undulating start of the Santa Rosa is a good way to warm up as you gradually descend to the first set of switchbacks and enjoy glimpses of the terrain that lays ahead. After about a half a kilometer (a third of a mile) you have a chance to warm up your climbing skills with a short ascent. There are 4 sets of demanding, descending switchbacks along your route. Between the first two sets at about the 2.5-kilometer (1.6-mile) mark, you pass through a striking oasis of boulders and palms. Just after descending the second set of switchbacks, you cross the large Canoas Arroyo at about the 4-kilometer (2.5-mile) mark. Before reaching the third set of zig-zagging turns, at just over the 5-kilometer (3.1-mile) mark, you reach the highest point of the trail. Along this section, inspiring, long distance views open over La Ventana Bay and the spectacular surrounding natural scenery. A short span before the final sets of turns, near the 8.2-kilometer (5.1-mile) point, you cross a narrow ridge that provides pretty views of the arroyo below. The trail ends at Rancho Las Canoas, nestled in a peaceful canyon, a historical focal point of the ranches. If this first introduction to our signature trail only whets your appetite, be sure to sign up for one of our Ride & Barbeque Days to enjoy this phenomenal MTB trail for hours of uninterrupted bliss! In September 2015, expert and extreme riders thoroughly tested the Santa Rosa mountain biking trail. In February 2017, we were honored to have extreme mountain biking pioneer Hans Rey as a guest in our El Sargento bike shop and on our ranches. Many thanks to Rick Campbell who posted this six-minute video on YouTube of riding the Santa Rosa with the legendary No Way Rey. In addition to commemorating this special occasion, the clip provides a glimpse of the trail's switchbacks and scenery.